The Kindle Fire launches today and with it results of a new study by Canadian investment bank RBC Capital Markets. 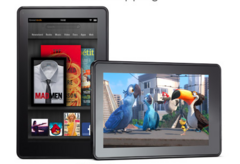 According to the study, a survey of 2600 early adopters found that 5 percent of them had plans to pre-order the Kindle Fire and within that 5 percent, 26 percent actually held off on their iPad purchases because of the Amazon tablet. 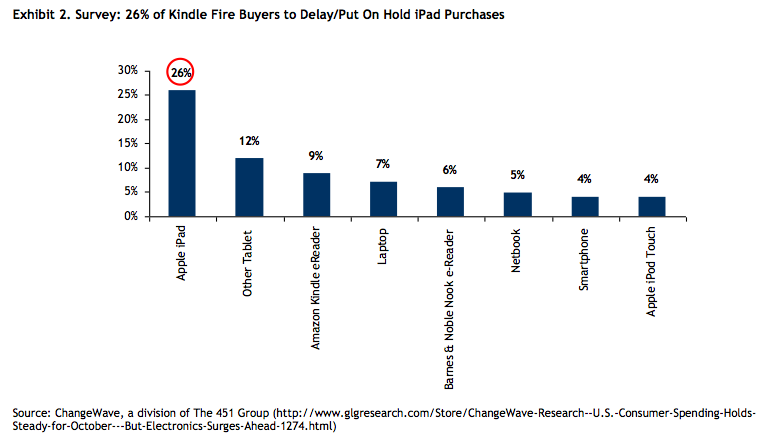 A few users have even delayed possible notebook or netbook purchases because of the Kindle Fire. The study, though, should be taken with a grain of salt. For example, the 26 percent of the 5 percent that delayed or canceled their iPad purchases is a very small number with regard to the 2600 sample size. If, however, the total sample size is a good representation of tablet market behavior, then the study means that roughly a quarter of all Kindle Fire buyers will forgo the iPad in favor of the Amazon tablet. 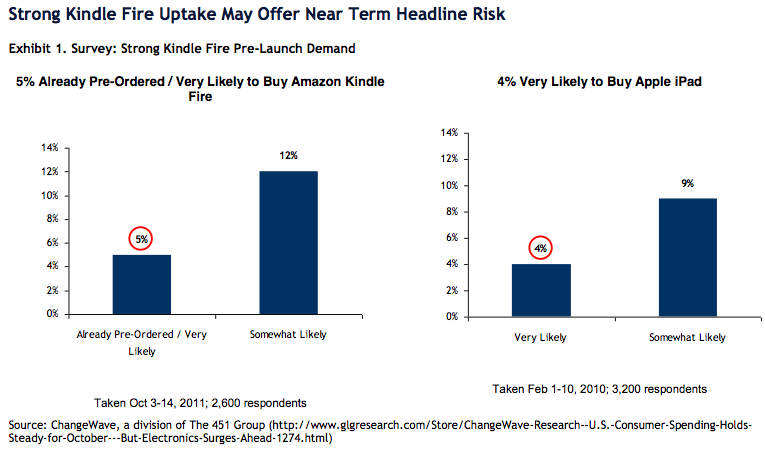 This would be a huge win for Amazon if the online retailer can indeed capture a quarter of potential sales from Apple from those who are interested in the Kindle Fire. The 7-inch Kindle Fire includes a 1GHz dual-core OMAP 4 CPU, 1024x600 resolution display, 512MB RAM, 8GB SSD and runs a highly customized Android Gingerbread OS. The tablet is most notable for its low $199 price tag or less than half of the current market price of the lowest iPad 2 model.